The difference between the junior and senior category is significant. First there is a greater audience attending the competition. The media and television are also much more present. The most surprising was to be among high-calibre skaters whom we only see on television. 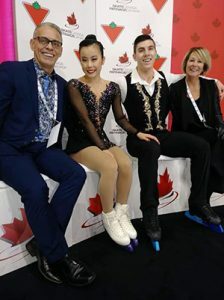 In St. John’s, the pair had their best scores and performances of the season. They finished 4th overall, scoring 60 points short and 100 points long. The atmosphere was extraordinary. Their families were present. Cameras circled the ice. They even went on national TV live streaming for the first time! With this 4th place, they were invited to the Champions Gala held the day after the competition. They performed in the show with some of their idols as well as members of their training team who are also very good friends.